If your personal motto is to live every day like it’s Taco Tuesday, you’re in luck. 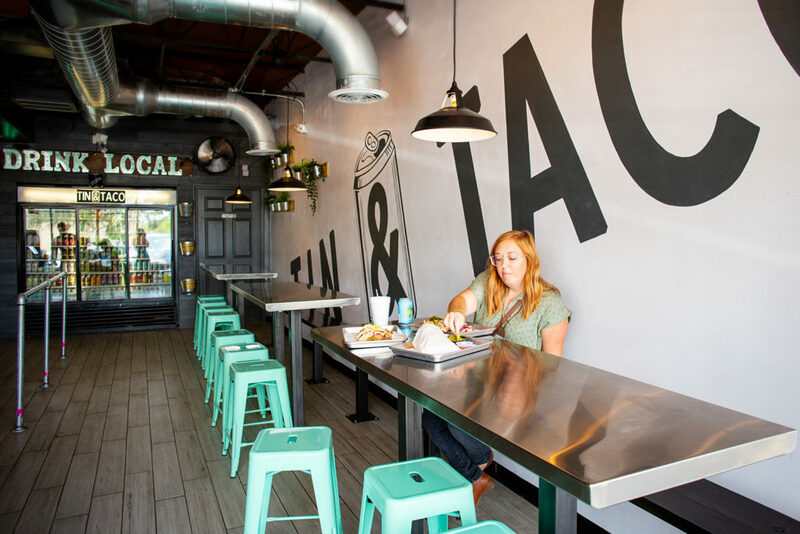 There are dozens of restaurants and hole in the wall taco joints in Orlando (and more on the way) where delicious tacos and date night-worthy ambiance mingle, setting the scene for the perfect night spent gazing longingly at your plate of tacos—oops, I mean your date. If you want to win some serious bonus points with your taco-loving other half, here’s where to take him or her for a delectable dream date. Every taco love affair has to begin somewhere, and for me, that place was Black Rooster Taqueria in the Mills 50 District. Here, the tacos are dressed simply (cilantro, onions, salsas, shaved radishes and the like) because the flavorful meat and homemade tortillas are so amazing you really don’t need all the extras. The restaurant is helmed by husband and wife duo John and Juliana Calloway. Inside, Day of the Dead décor contributes to the vibrant and artsy interior, while the open kitchen and steady stream of patrons contribute to the lively atmosphere. 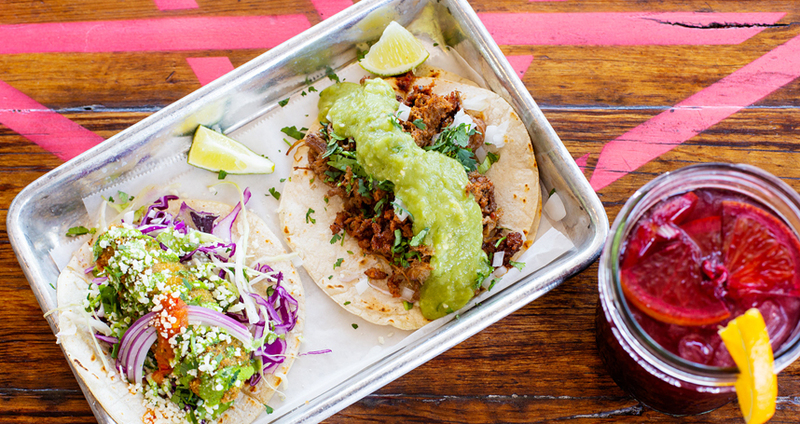 Favorite tacos include the crispy fish, chicken tinga and signature Black Rooster asada. Several vegetarian options are also available. Whatever you do, make sure to order the made to order fresh guacamole. Just a heads up, the restaurant closes daily for a few hours between lunch and dinner, so get your fix before 2pm or after 5pm. Bonus: Black Rooster is located next door to The Guesthouse and the two combined make for an amazing double date. Every aspect of Hunger Street Tacos is a celebration of Mexican culture, from the authentic Mexico City street food fare to the colorful murals lining the walls (painted by Lapiztola, a group of four artists) and the passionate brothers, Joseph and David Creech who own the business. Taco lovers owe thanks to Joseph’s wife, Seydi, whose taco craving led to the formation of a catering business and eventually the restaurant in Winter Park. Pay homage to the restaurant’s roots by ordering the taco that started it all, the signature Suadero taco. While the tacos are fantastic, you’d be doing yourself a disservice by not branching out to order more than just tacos. Dishes like the indulgent marrow and mushroom sope and squash blossom quesadilla shine a spotlight on the talented chefs and act as a wonderful introduction to authentic Mexico City cuisine. This is a yummy place to take the vegan or vegetarian in your life, too. FYI: Parking is available behind the restaurant and across the street in the church parking lot. All seating is outdoors under a covered patio. Colorful details and a warm, inviting staff will make you feel right at home at Ocoee Taco Company. This hole in the wall taco joint in Ocoee quickly reaches capacity at dinner hours when families and couples from near and far stream in to pick up to-go orders or nosh on budget-friendly eats. Tacos are around $2 each and there are a variety of meats to choose from, like carnitas, asada, pollo and more. Order at least three to fill up, with your favorite Jarritos flavored beverage of course. To make it a complete date, head over to the newly opened Toll Road Brewing Company (don’t forget your Central Florida Ale Trail map) for a craft brew before walking down W Oakland Ave for a sunset smooch at Bill Breeze Park, located on the shores of Starke Lake. Anything restaurateurs Jason and Sue Chin create is guaranteed to be a hit and Reyes Mezcaleria is no exception. You’ll find this stunning restaurant serving upscale Mexican cuisine in the heart of the North Quarter District. You can certainly get your fill ordering an assortment of tacos (there are six options on the menu), but make sure to save some room for appetizers and dessert. Start with something hearty like the sharable ceviche (made with citrus cured local light caught fish, Serrano chiles and olives) or elote. Don’t skip a cocktail; Reyes has a large selection of mezcal and tequila and plenty of craft cocktails to imbibe. The hearty trays of tacos at bartaco make for pretty Instagram photos (guilty) and thankfully the tacos taste delicious. Thanks to their small size (each taco is about 3 bites each) you can shamelessly order a whole tray of tacos for yourself. The restaurant is located in a strip mall in Dr. Phillips, but the lush outdoor patio and bright interior exude beachfront vibes that will transport you to your own personal taco paradise. There are 13 taco varieties on the menu, but I recommend the baja fish (made with tempura-battered cod), the glazed pork belly, and the savory roasted duck. Make sure to ask your server about the current “bartaco secret”, an off the menu taco special that rotates frequently. Earlier this year, downtown Orlando’s Kasa rebranded to Chela Tequila & Tacos, trading global cuisine for Mexican-inspired delights. While some traditions remain the same (wine Wednesdays and an epic brunch buffet on the weekends), new celebrations like $15 all you can eat tacos on Tuesdays make this a haven for taco connoisseurs. I was surprised by how good the tacos are (try the Crispy Pig and the Drunken Fish) but the real star of the show is the churro dessert. Dusted in cinnamon sugar and served with vanilla ice cream and chocolate sauce for dipping, it’s worth skipping that third taco (I can’t believe I’m suggesting this) to save room for something sweet instead. Where can you sip a fresh margarita on a rooftop, make your Taco Tuesday dreams come true and explore a hip walkable neighborhood? Answer: The Whole Enchilada in downtown Winter Garden. This newcomer to Plant Street opened to much fanfare earlier this year, and the restaurant’s best aspect is its colorful and spacious rooftop bar. Tropical details and an upbeat playlist set the low-key party vibe upstairs, while bright foliage and neon signs in the downstairs dining room up the ante on the fast-casual concept. This is not the place to go for authentic tacos, but the food is fresh and tasty and the guacamole is a must. Ordering a margarita is a necessity; each is made with fresh sour mix and fruit and flavor varieties include mango, watermelon, prickly pear and strawberry. Agave Azul is far from a dedicated taqueria, offering a borderline overwhelming menu of Mexican cuisine aside an equally large assortment of margaritas. The new Winter Park location is bright and airy with a central bar where you could easily lose a whole afternoon as you share chips and salsa and one margarita turns into two, then three, and so on. The restaurant’s signature taco offering is the platter of pork carnitas tacos. The Dos Equis-soaked pork is slow braised for 24 hours and the tacos come garnished with cilantro and onions atop three corn homemade tortillas. Frozen house margaritas come in an assortment of fruity flavors like strawberry, mango and raspberry, while the specialty margaritas are slightly more exotic. The Amor y Odio margarita is a feast for the senses made with 1800 Silver, blood orange liquer, blood orange puree, lime and a splash of grapefuit juice. Another Winter Park favorite, Cocina 214 is tucked just off of Park Avenue. Serving a hearty menu of Tex-Mex fare, this is the ideal place to take any taco lover without sacrificing atmosphere. The rich, trendy interior gives way to a bright covered outdoor patio ripe for people watching while you dine. Note: there’s also a new Daytona Beach location should you find yourself craving tacos while on the east coast. Must-try dishes include the queso fundido appetizer (add chorizo!) and the classic rotisserie chicken tacos topped with Poblano salsa, roasted corn and queso fresco. All your favorite margarita options are on the menu along with a few unique concoctions. The Pop Rocks Rita is a party in your mouth, comprised of Tierras organic tequila, agave, fresh lime and cranberry garnished with a Pop Rocks rim. Owned by the owner of Gringos Locos, Robert Bair, Tin & Taco became a fast favorite when it opened its first location in downtown Orlando. But parking can be a pain and seating is limited. The new SoDo location solves both of these problems with a full-blown parking lot (taco lovers rejoice) and a more spacious dining area. There’s also an expanded menu with more than 20 taco varieties to choose from, broken down by the type of meat. Cheese-crusted flour tortillas come stuffed with things like craft beer mac & cheese (the Mac Attack—I recommend swapping the ground beef for brisket) and traditional tacos get an upgrade with the addition of crushed Doritos (the Tacosaurus, my personal favorite). The tacos are huge, so order wisely. Friendly service, top-notch creative tacos and the endless menu options will keep you coming back again and again. Beloved by many as one of the best places in Orlando to grab a very late night bite (Tako Cheena is open until 4am Friday & Saturday), Tako Cheena’s fusion tacos taste just as good during the daylight hours. Owner Edgardo Guzman serves up tasty Asian fusion tacos like the Thai peanut chicken (topped with cabbage, cilantro, scallions and crushed peanuts) and Chinese BBQ Char Siu pork belly (with crispy pork rings and ginger scallions). There are seven tacos to choose from. If you feel like going on a taco scavenger hunt, take your date to one of Tako Cheena’s newer semi-secret locations at Stonewall Bar (if the Tako Cheena banner is out, the kitchen is open) and the Massey Cadillac dealership on John Young Parkway (open for lunch Monday-Saturday from 10am-3pm). Mills 50 is the ideal area for a taco crawl, with Black Rooster Taqueria, Tako Cheena and Pig Floyd’s all within a quarter-mile of each other. Yet each maintains its own distinct offerings in the taco realm, with Pig Floyd’s claim to fame being lip-smacking good BBQ and global fusion tacos with Indian, Mexican and Korean flavor. For a taste of the BBQ, order a La Vaca Tahkaw, a taco stuffed with smoked and braised brisket, lettuce, tomato, red onion, cheddar cheese, toasted black sesame seeds and drive-in sauce. Make sure to order a side of maduros (sweet plantains) to share. Pig Floyd’s has also expanded to a second location in Lake Nona. Did we miss your favorite local taco joint? Share it with us in the comments! El Patron is amazing, with all you can eat buffet taco bar for $10 M-F! Margaritas are the best I’ve had in town. Check out pics on Insta or in person. Best Mole in town too! Sounds like a great deal. Thanks for sharing! The Winter Park location is so cute! Adding it to the list. Thanks! Awesome! I haven’t heard of that one so I’ll put it on my list to check out. Thanks for sharing! Wow, there are quite a few I need to try when I visit Florida! There are so many great places!